Siemens announces an upgrade to its weighing technology portfolio to include two complete packages for standalone applications. 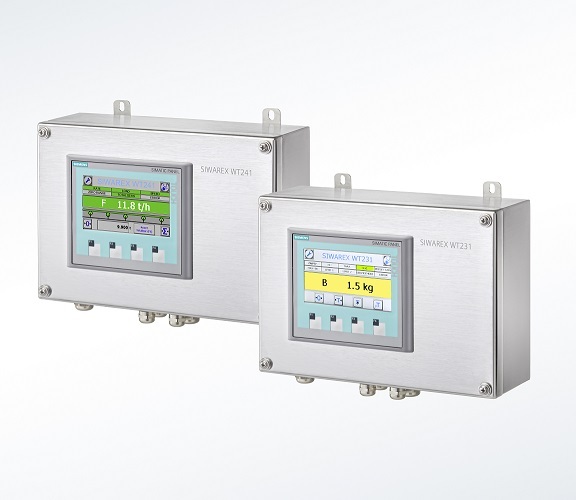 The new weighing terminals Siwarex WT231 for non-automatic scales and Siwarex WT241 for belt scales and solids flow meters combine weighing electronics and touch panel in a single unit. The two new weighing terminals can be set up as a standalone solution with speed and simplicity, and using an RS485 Modbus RTU interface they also allow integration into any commonly used control environment. Due to its extensive diagnostic capability and limit value control, the Siwarex WT231 weighing terminal with integrated WP231 weighing module can be used in industries demanding a high degree of accuracy, like food and beverage production, pharmaceutical, and chemical industries. The WT231 weighing terminal is well suited for measuring the amount of product in a bin or tank where the mass of the material is required. It can also be used where non-contacting measurement is needed, but other non-contacting technologies are not appropriate because of pressure or temperature. The Siwarex WT241 weighing terminal with integrated weighing module WP241 for belt scales offers not only a high level of measurement accuracy but also an array of supplementary functions. Six totalizers determine the required material quantity. In addition, a simulation mode for belt speeds and belt loads enables a full-fledged application test – even without the scale or speed sensor connected. The two new weighing terminals are equipped with a 4-in. touch panel and a high-resolution TFT widescreen color display. They provide valuable support to users in the form of intuitive operation as well as rapid parameterization and commissioning reducing downtime for commissioning and maintenance. The IP65 protection rated stainless steel enclosure allows the new complete packages to be used in a wide range of different industries from food, pharmaceutical and chemical through to mining, cement production, and steel making.